A couple of very busy weeks passed by and probably another one about to come. I had my usual spur-of-the-moment big family dishes at the end of a tiring day to de-stress and that’s about it. I couldn’t find the time to write about them. Technically, I am in my self-proclaimed 2-day holiday (yesterday and today) to complete a long weekend till Sunday but that’s another story. Anyway, I just thought I’d share this very easy homemade gravy recipe for those with kids who love this be it on chicken, steak, burgers, mashed potatoes, or rice. That’s right… rice! Ages ago as kids we love lots of gravy to dip our fried chicken in. With W (and a couple of other kids) who grew up in Manila – he pours his gravy over rice and eat with gusto. The kiddo sees it and follows suit ha-ha! Add chunks of butter to a medium-sized saucepan. Heat until butter melts. 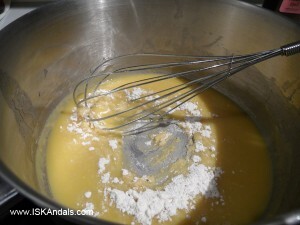 Add a portion of the flour and whisk into the butter until blended. Repeat this process until all flour is whisked into butter and well blended. Keep whisking over low heat for about 10-12 minutes or until it smells like you are cooking a pie. By this time it should be a bit brown and with tiny bubbles. 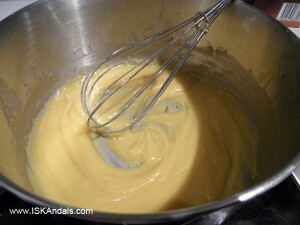 This mixture I believe is called a roux. Flour should be cooked long enough; otherwise your gravy will have that raw flour taste later on. Add stock 1 cup at a time. 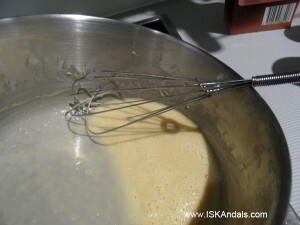 Whisk until absorbed by the roux, no lumps at all. Repeat until all stock is absorbed. Keep whisking for another 10 minutes. This should be thick and creamy, not lumpy, by this time. Taste. Add salt if you think it’s necessary. I normally leave it as it is when I use salted butter. Sprinkle with freshly ground pepper. I like a lot! Whisk before serving hot as a condiment, or over mashed potatoes, or, like my boys, over rice. 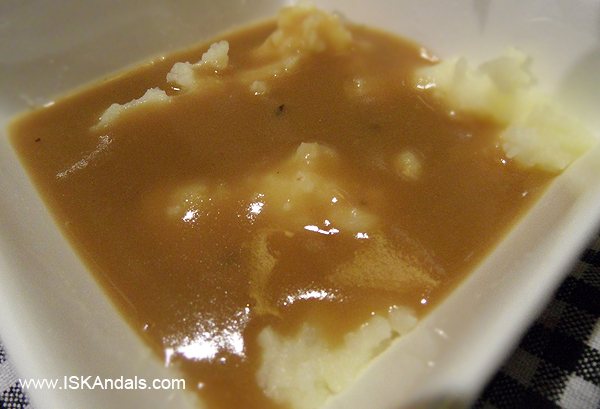 Below shows gravy poured over mashed potatoes. This one made with beef broth and bacon grease instead of butter. Add stock 1 cup at a time. 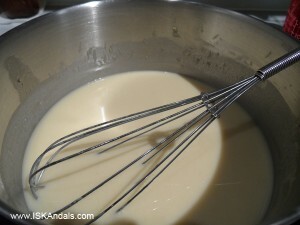 Whisk until absorbed by the roux, no lumps at all. Repeat until all stock is absorbed. Keep whisking for another 10 minutes. This should be thick and creamy, not lumpy, by this time. Taste. Add salt if you think it’s necessary. I normally leave it as it is when I use salted butter. Sprinkle with freshly ground pepper. 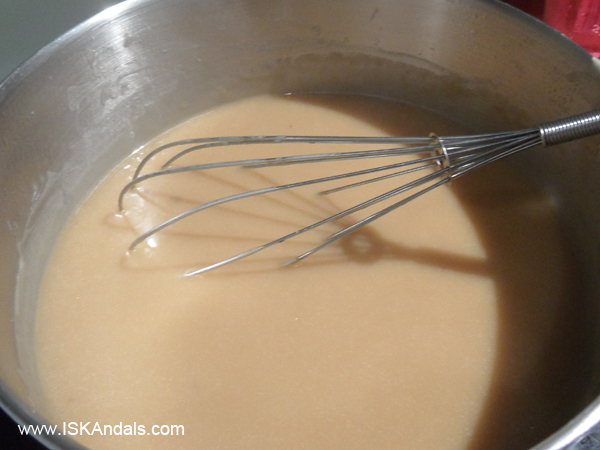 Whisk before serving hot as a condiment, or over mashed potatoes. It should always be 1:1 for fat and flour. My proportion is always 1:1:8; that would be fat to flour to liquid. 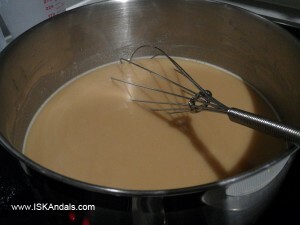 If you want thicker gravy, increase fat and flour, or just add cream later on. Sometimes I add a full tbsp of sour cream. Fat can be drippings from previous cooking – like steak, burgers, chicken or bacon, just remember to strain the liquid to remove bits and pieces before using. The more spices you add to the meat you are cooking, the tastier the gravy. Alternatively, melted butter is just as good. The broth also adds to flavorful gravy. You may make your own using chicken or beef or you can just buy packed stock made from natural ingredients. I find that using beef stock is tastier and, of course, suits steak and patties better. Some people darken their gravy with a little Worcestershire sauce or soy sauce or even a dash of granulated coffee. It’s all up to you. I kinda like the final natural color of my gravy so I leave it as it is. Using a whisk avoids lumps. If you don’t have one, or have it but still end up having lumps (I’m sure it won’t be lumpy with a whisk), run your gravy through a strainer before serving. That gravy of yours looks appetizing. I’m sure it’s as good, if not even better, than KFC’s or Savory’s gravy. Hmm… I think mine is better! Hahaha! I still pour gravy on rice, yum! I remember Salisbury steak and I used to put lots on my rice. So I tried the gravy on rice, too. Nice! Ahahaha! Pareho na din kami ngayon Because of the kids! Haha! Yeah, the whisk makes a difference. I used to work it with a wooden spatula and I always end up with lumps. And thanks for this gravy recipe… di nako bibili ng ready to cook gravy… hihihi…. I got frustrated with the ready-to-cook gravy that I used to buy… they just don’t taste the way we like it. my boys also put gravy on their rice, lol. bookmarked! looks so yummy, thanks for sharing your recipe and about that roux thing! i actually made gravy the other night, (i forgot to buy mccormick gravy pack) but i failed, it was ok but it was not that good, i can taste a bit of flour…now i know that i did it the wrong way. i even add worcestershire sauce kasi sabi dun sa recipe na nakita ko online. i also love to used whisk kapag gravy at mga sauces. anyway, i will do your style next time, will let you know! here from FTF, see you around. thanks again and have a great week.